McKensey Heath, 16, is from Wytheville, Virginia. He’s a high school sophomore. He is also an assistant instructor at Southwest Martial Arts and Mentor for Learn Today, Lead Tomorrow, Inc. He’s been training in Martial Arts for 9 years. He is Purple Belt in Combat Jiu Jitsu and1st Degree Black Belt in Tang Soo Do Karate. He looks up to Sensei Greg Ring and his father James Heath. McKensey is a highly skilled yet modest competitor. He always challenges himself in the Advanced division. He fights higher/ upper(?) weight classes and has often competed in Men’s divisions with several notable wins. He has a deep interest in helping others to learn martial arts and spends a lot of his time mentoring younger kids. He has an interest in the military and has a goal to attend the US Naval Academy and become a US Marine officer. 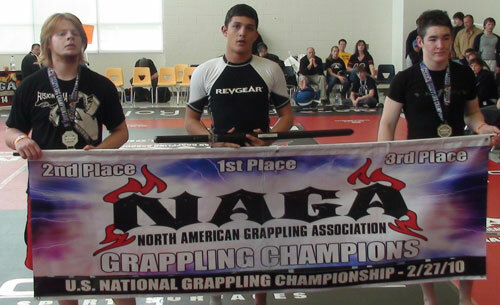 McKensey has been competing in various Jiu Jitsu and grappling championships all over the country since 2002. He is Ranked National Champion 14& under (2007), Ranked National Gi and No-Gi Champion 14&under (2008), Ranked National 2nd place Gi and No-Gi in Teen Division (2009) to name a few. McKensey is planning his MMA debut on April 24, 2010 in Virginia Beach, VA in the Modern Gladiators promotions. Revgear wishes him luck! On photo: NAGA US Nationals, February 2010. McKensey Heath placed 1st inTeen No-Gi Advanced Middle Weight 14 & 15 year olds, 2nd Teen Gi in Advanced Middle Weight, 1st Teen No-Gi in Advanced Heavy Weight 14 & 15 year olds.